Elon Musk’s underground transportation business, The Boring Company, has won a bid to create an underground high-speed rail line in downtown Chicago. The company beat out at least four other developers for the project, and Chicago Mayor Rahm Emanuel is expected to make an official announcement this afternoon. Unlike Musk’s much-hyped plan for a Hyperloop, this new proposal is for a slower system that Musk is simply calling Loop. If it’s actually built, Chicago’s Express Loop (not to be confused with the neighbourhood of the same name) will take passengers the roughly 18 miles between downtown Chicago and O’Hare Airport in about 12 minutes. The existing above-ground Blue Line trains currently take about 40-45 minutes to travel that route. Both the mayor’s office and The Boring Company have reportedly declined to discuss how much the project will cost to build, but according to the Chicago Tribune, the Boring Company is footing the bill. For users, the rides are expected to cost between $20 (£15) and $25 (£19), according to the earliest estimates, which is roughly half the cost of an Uber. The L, Chicago’s elevated train system, currently costs $5 (£3.70) for the same trip. 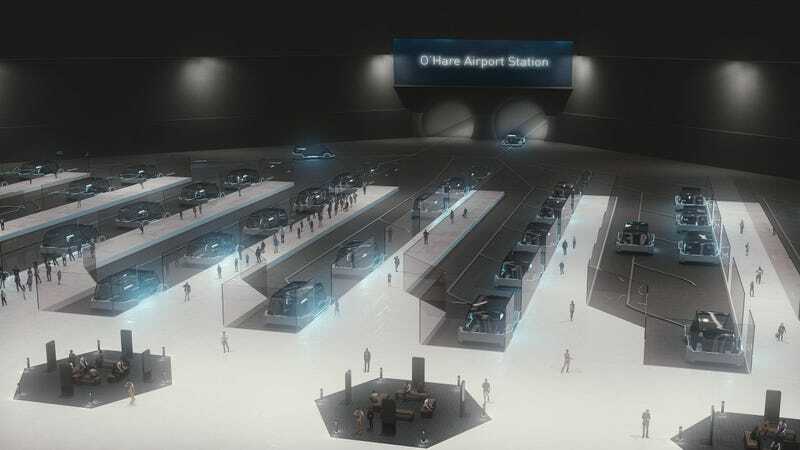 The Boring Company insists that it won’t have to deal with land rights on any major scale since it’s tunnelling below the city, though it will have to secure rights for the stations. Last month, Musk told an audience in Los Angeles that stations for that city wouldn’t be much larger than a parking space. 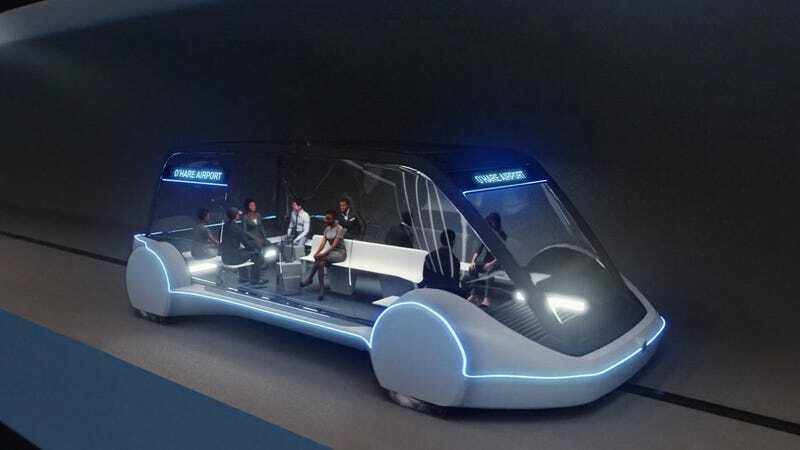 The company hasn’t released any information yet about how big the footprint for Chicago’s Loop system stations might have to be, though judging by the concept art, it would be considerably larger than a parking space. Today’s press conference will reportedly be held at Block 37, a failed transit superstation that was foreclosed on in 2011. The site currently has residential apartments, retail stores, and an AMC movie theatre, but its transportation areas are dormant.